It's been a while since I've handled an LG phone so I thought I might review the LG Cookie or LG KP500 next since it's only about 100 Quid. 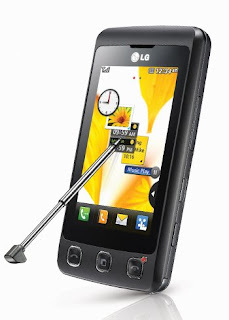 The LG Cookie mobile phone seems to be the cheapest touchscreen phone in the market today. 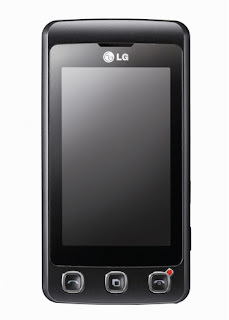 The LG Cookie mobile phone has a large 3 inch display with three hardware buttons at the bottom (the call buttons and the menu button). It looks stylish enough and only slightly thinner than the iPhone 3G. As seen in the TV ads, the stylus can be found at the bottom of the phone. I'm not expecting a lot from the LG Cookie, I mean, for 100 Quid you can't expect this cheap mobile phone to compete with the iPhone but for those budget conscious individuals who wants in on the touch screen revolution, the LG KP500 may be the perfect phone to start with. The widgets on the LG Cookie reminds me so much of my Samsung Omnia, the only cool thing about it is that when you shake it, the widgets would arrange themselves in proper order(BTW, the LG KP500 has a built in accelerometer). Now I really wish that Samsung would get to that SDK kit for the Omnia so developers would start making new widgets for it. Since this is the cheapest touchscreen phone in the UK, I didn't bother searching for its processor. 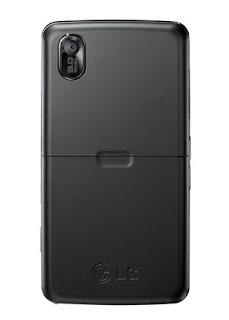 If you've already handled the Omnia or the iPhone you know that when you first get hold of the LG KP500 mobile phone, the touch screen action is laggy. You can see how laggy it is when you turn the phone sideways and it would take a while before the LG Cookie goes to landscape mode. I've heard other users say that the phone constantly hangs or resets itself, I only had that once during my two days with it. Music Player wise, I wasn't disappointed with the LG KP500. The speaker on this mobile phone is superb and it's almost worthy to be called a music phone. You can even update the album info on the LG KP500. As for the camera, the LG KP500 sports a 2 3 megapixel camera WITHOUT autofocus. Needless to say, you shouldn't expect much out of the LG Cookie phone if you're looking for a camera phone. It can do a good job especially if you're outside and it's sunny but indoors, picture quality is not great. The LG KP500, unlike the LG Viewty can't play DiVX videos though it can play MPEG4 videos at 24fps. The screen resolution is excellent though doesn't fare well if you use it on direct sunlight. The LG Cookie mobile phone has a good browser though it's slow reading web pages, maybe because it's only running on EDGE and has no WiFI or 3G. Too bad but like I said, for 100 Quid, I didn't expect it to have one. I was actually surprised that I like the LG Cookie. I've heard some bad reviews about this mobile phone but the slow touchscreen response is really a non-issue for me. For those wanting to get into the touch screen action but you're on a limited budget, I would highly recommend the LG Cookie, it has a good music player and a very nice interface. You get what you pay for and for 100 Quid (I keep saying that a lot but the price of this phone just blows me away) the LG KP500 is worth it. Nice to hear you review of the LG Cookie, I'm considering buying one. Graham - www.logo-n-stitch.co.uk. Thanks for the review. I have bought one yesterday and its absolute amazing. I bought LG KP500 two weeks ago. Just like you, I don't buy anything without knowing it. Most of the reviews recommend this phone. It has qwerty on screen key board which is quite handy in typing messages, just turn the phone to horizontal position and you get onscreen qwerty key board to type messages. I also encounter people complaining about LG PC Suite. Most of the people complaining about phone not able to recognized by windows XP, I am having same issue but upon further investigating I found this issue is related to windows XP not with LG PC suite, I tried to install LG PC suite on windows XP home edition with USB connectivity first time it worked fine then I disconnected my phone and tried to reconnect via the USB but result in windows error: “unable to recognize the device”. But it works fine with blue tooth connectivity; I didn’t find any issue with blue tooth connectivity. At work I am using windows XP professional edition and I never encountered any issue in connectivity with USB. The 3.0 mega pixel camera is embedded but without zooming capabilities. You can make videos can take pictures. I got free 1GB memory card with the phone, you can upgrade it up to 8GB, but I won’t advice you to go for it as it might slow down your installed applications. It doesn’t have WIFI and it is not iphone but it has lots of cool feature. The phone is cheaper as compare to any touch class phone. I really like it, it is quite cool. your lg phone can only connect if you have no applications running on your lg cookie phone. press the middle hard button (shows favourite apps ) and then touch screen arrow to change to (running apps) tap on end all. I was tryin 4 ages 2 connect with usb but when ended all applications it worked perfectly. Thank you. It's a pity that piece of info wasn't in the User Guide!!!! I've really been trying to give the Cookie a chance, and there are some things I like about it, but ultimately it's a case of novelty value being worth less to me than the prospect of sticking with it for another 17 months of a contract with Orange. My gf loves the "drawing panel" application, but I'm always worrying about losing the stylus and it's a phone damnit! After my encounter with the touch screen phone "revolution" it just feels like a bit of a fad -- why emulate a numeric keypad or a QWERTY keyboard (that's too damn small unless you're using the stylus), regardless of how much "haptic feedback" that may be provided (although I soon turned the buzzing off as it drains the battery and gets annoying)? The easiest and quickest method I've found of texting on it with my finger(s) has been the numeric pad with T9, which feels silly and awkward even though the virtual buttons are bigger that way. Some of the UI novelties are fun for a while, but I tend to prefer practicality more than "eye candy" -- it's so bloody slow when it's trying to switch between the two idle screens, or even simply loading a menu! And I'm tired of being annoyed by a massive translucent popup message every single time I send a message, or change a setting... Alerts are fine normally, but the animations are repetitive! I found the apps. brilliant however it's battery life is crap. Memory crap. and downloading crap...however its a barg! At under £100! Really good i recomment however like all phones it has it's down sides. Much better than the iPhone. my LG Cookie hang up so i took off the battery and turn it on again but after turning it on it's still hanged up.help pls..
just wondering can you turn the phone sideways and text on it?? i was wondering if i could change the settings of the drawing panel..
when you edit a picture you can chose alot of colors but in the drawing panel it only has ten ..
WELL ONE LG ONE PHONE THAT I LIKE ! How and reliable is the video clip recording with Cookie? Is there any problems with the clip length? hey is it true dat u dont have zooming in the camera?? n ive even heard dat u cant change ringtones..is dat true?? wat is a camera phone wid no zooming capabilities? even a 3000 rupee vga camera supports zooming!!!!!! Everything is decent about this phone except the PC Suite that it comes with. It's a bit buggy. For instance trying to install more than one application or game can be annoying because after the first installation the phone refuses to connect. I've also have Vista bluescreen on occasion due to the same connectivity issues trying to disconnect and reconnect the phone. this phone looks so good and for only £87.95 with £10 airtime included, im going for it it sounds so amazing, and after comparing it for ages with a samsung tocco lite! although the tocco lite has a better camera its not very good!!!! AND the tocco lite is more expensive!!! thanks for everyones reviews helped me to decide on buying it! I got the LG cookie for christmas, and first of all eerytime I went into my memory card it would turn the phone off and on again, I took it back and they tried many things to stop it from doing this and it didnt work so they gave me a new one. Then the phone started to turn its self off and on again. Then it started to reset itself, when its turned on and when I turn it off, I now dont turn my phone off. The screen also cracks very easily, so if your thinking of buying this phone then also pay for insurance. I am finding this phone so annoying because its resetting and I think it would be too late to take back even tho it has been under a year and does have insurance on it, I am thinking of buying a new phone 8 months later! This phone is an absolute nightmare. Texting is ridiculously difficult. The touch screen is very irresponsive, the phone is VERY slow and freezes frequently. It’s made out of cheap plastic therefore meaning it breaks easily. I have had it 6 months and it has broken and won’t charge, LG have refused to fix it even though it’s in warranty. This has been the worst phone I have ever brought, my advice stay well away. the phone is the worst. My KP500 was sent away to repair centres "4times" and still i have the same software problems. Has anyone had trouble connect to blue tooth handsfree kits with the kp500? Everytine you try to connect the phone switches off? LG KE850 its a great phone to use but for the basic user. I don't think that this has got sufficient features in it, but the music is good. I have had the L.G cookie for a year now and it has started not to work properally. first of all i liked it but i was so hard to get used to. But i wouldnt recomend it has not got good memory, the camera isnt good you can not zoom in and hasnt got a flash for it. And the internet is really slow. i would only recomeend getting it if you need it for just calling people. Its a nice phone, very reasonable and good features. i had problems with zooming in on the camera it just wouldnt work and then i found how to do it go into settings and change the size setings and then on the camera you should get an option appear to zoom in and out. It works great, haven't got any issues about connectivity yet. Only thing I still don't know how to do is to edit the Widget Idle Screen, how to insert a new word into the T9 or how to tap forward to start another letter that uses the same number button of the previous letter when not using T9.